In the previous part 4 we have seen how to load balance remote consumers on a queue using network connectors. As shown above, we have Broker-1 which initiates two network connectors to Broker-2 and Broker-3. 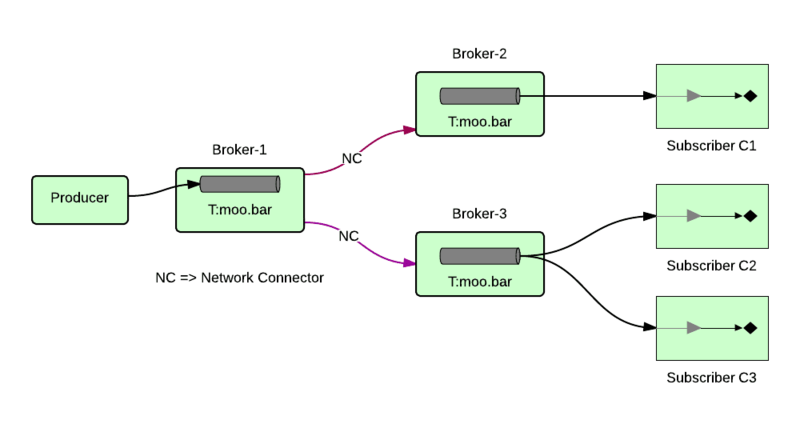 A producer sends messages to a topic "moo.bar" on Broker-1 while Broker-2 has subscriber C1 and Broker-3 has two subscribers C2 and C3 on the same topic "moo.bar". You may observe that this set up is very similar to part 4. The only difference is that here we are dealing with topics while in part 4, we were dealing with queues. Let's start broker-2, broker-3 and broker-1 in that order. Let's start the subscriber C1 on Broker-2 subscribing to messages to topic "moo.bar" and subscribers C2 and C3 on Broker-3 subscribing to messages on same topic "moo.bar"
Durable Subscribers require unique combination of client id and subscriber name. In order for us to create durable subscribers C2 and C3 we need to enhance the functionality provided in /Users/akuntamukkala/apache-activemq-5.8.0/example/src/ConsumerTool.java where /Users/akuntamukkala/apache-activemq-5.8.0 is the directory where ActiveMQ is installed. The modified code consists of editing build.xml and ConsumerTool.java to add a new parameter "subscriberName". The edited files build.xml and ConsumerTool.java can be obtained from here and here respectively. Let's start the subscribers now. As you may observe, Broker-3 receives the same message twice, once per each subscription C2 and C3. ActiveMQ by default does not permit processing of duplicate messages. As you can see even though the enqueue counter shows 20, the dequeue counter shows only 10, since the other 10 messages were discarded by the Broker-3. This is a useful feature which helps to ensure that a message gets processed at most once by a broker. Let's retry the same scenario using a minor tweak in the network connector settings by making conduitSubscriptions="true" on both network connectors from Broker-1 to Broker-2 and Broker-3 respectively. After restarting the brokers, delete the inactive durable subscribers and then repeat the above steps. The following screenshot shows that Broker-1 now sees only two durable subscribers, one from each broker, Broker-2 and Broker-3. Durable Subscribers in Broker-1 when conduitSubscriptions="true"
Upon publishing 10 durable messages on Broker-1, we find that we don't have the same issue of duplicate messages this time. As expected all the 10 messages are processed by C1, C2 and C3 as shown by screenshots below. Hence we have seen how conduitSubscriptions attribute can help in reducing message traffic by avoiding duplicate messages in a network of brokers. In the next part 6, we will see how ActiveMQ provides "message replay" capabilities in order to prevent stuck message scenarios. Gone through all your AMQ relatd write-ups. Very good collection of information. Thanks a lot for this. Did you get a chance to explore LevelDB replication with AMQ. Not much information is available except the official one @ http://activemq.apache.org/replicated-leveldb-store.html. Can you share your thoughts on that? when can i see the part6 and part7? Hi. If part 6 and 7 are available now?Hopefully they should be. Can you please pass me the link for the same.